Pillars of Eternity, developed by Obsidian Entertainment and published by Paradox Interactive, is a true RPG through and through, and it wants you to know this from the get go. Between 11 classes, 6 races, several sub-races, nationalities and social backgrounds, the sheer amount of customization available for your character is insane for a modern game. I ended up making a male island Aumaua explorer Cipher, which is basically a stockier version of the blue aliens from Avatar, beefed up with telepathic and telekinetic abilities. With this kind of character customization, and literally each option having a sizable paragraph’s worth of lore/back-story/description to go with it, be prepared to clock ludicrous amounts of time into the game before even playing the intro. Damn right this is an RPG. Once you’re actually playing, the first thing you’ll notice is how gorgeous the game looks. The backgrounds are absolutely beautiful, and the grandiose effect lent to large structures by the perspective and disparity between static background and game model is present here as well, hearkening to the Infinity Engine games of old. Basically all of this game could be described as “like the old Infinity Engine games…”, but don’t let that fool you. 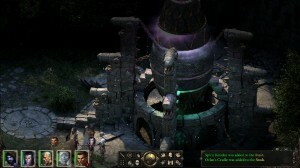 Pillars of Eternity is a great game even when the rose-tinted glasses fall off. 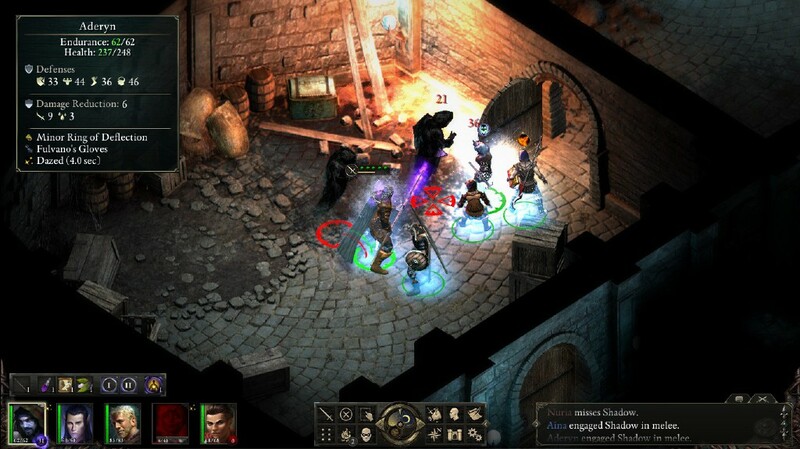 You play from an isometric perspective, controlling a party of adventurers each with different abilities and traits. You encounter enemies during your travels who also have their own abilities and traits. Pit those abilities and traits together, throw some invisible dice, and someone dies. Of course, that’s over-simplifying it a tad. There is a fine measure of player agency involved, so the outcome of an encounter isn’t only based on numbers and chance. Different classes have a plethora of offensive, defensive and support skills to utilize during combat. You don’t come across party-members that are linked to the plot very often in Pillars of Eternity, but the game compensates by adding the option to hire custom adventurers. After tentatively choosing the Cipher class for my main character after much deliberation, I jumped at the chance to give some of the other classes a try, and promptly made a Elf-Moon Godlike Priestess and a Boreal-Dwarf Monk(ess?) to complement the Wizard and Fighter that joined up during the plot. Of course, later on in the story you meet other properly characterized party members, but in the mean time you’re going to need the custom adventurers if you don’t want to be torn to shreds by the sudden appearance of a wandering wolf-pack that you bump into while exploring. The combat itself is sufficiently challenging even on the lower difficulties if you’ve got a small party, and is based around a real-time-with-pause system. Another thing directly proportional with party size is how fun combat gets. If you have between 1 and 3 party members, combat is solid and just shy of boring/repetitive. 4 party members and you’ve got a bit of a roll going on. 5 feels like some measure of tactics is finally involved, and the managing of the followers actually requires some effort. With 6, you’ve got a rave. Thanks to the pause option, you can always take your time to look over the battlefield and issue orders to each individual party member; so it’s an orderly rave, but a rave nonetheless. Both the basic menus system and the combat menu system are easy to use and free of clutter, making everything easy to manage. The leveling system is quite straight forward, with a process somewhat similar to character creation, albeit less extensive. Something that Pillars of Eternity does differently from other RPGs is that kills do not give experience points. You can level up by exploring or completing quests, but don’t expect to grind enemies for that coveted next level. There is a sneak mechanic for all party members, and if everyone you take with you has a sufficient stealth rating, it is possible to ghost through much of the game. Your stats don’t only affect the outcome of combat, however, as certain skill-checks may allow for a different path in conversations and scripted events. An example from early on in the game is a crumbling section of wall that allows you to climb atop a section of an ancient ruin. This can be achieved either with a grappling hook bought from a blacksmith or, if one of the party members has a sufficient Athletics rating, they can scale the wall and help the others up. The options you choose in conversations also affect your reputation and morality. If you’re constantly malicious with the inhabitants of a village, they might stop cooperating, or if your party member who worships the god of vengeance and deceptions always sees you acting like a goody-two-shoes then they will likely lose respect. 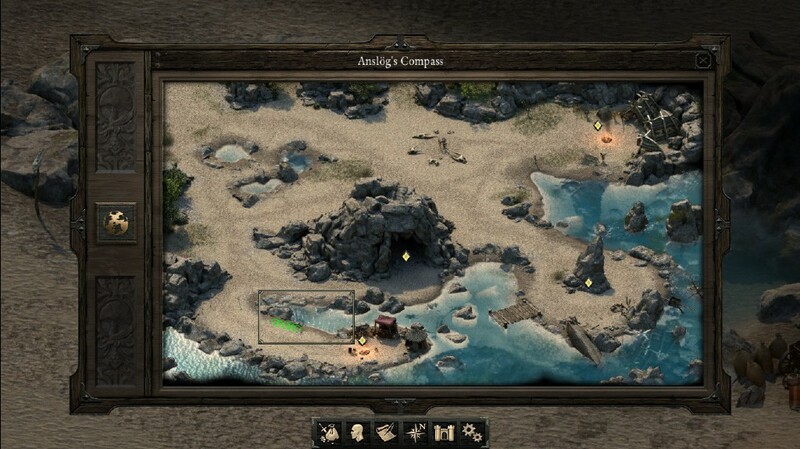 As for the plot of Pillars of Eternity, the game is set on a peninsula called the Eastern Reach; an area that has been relatively recently colonized by other, larger nations, such as the Aedyr Empire. You set out from your homeland with a caravan to seek fortune. You head to the town of Gilded Vale, a town in the nation of Dyrwood, former part of the Empire. You fall ill during your journey, and while you’re off to collect herbs to treat your condition, the caravan is slaughtered by angry locals for allegedly trespassing on sacred ground. As you defeat the attackers (or choose a diplomatic path), a supernatural wind blows your way. These soul-winds aren’t rare in these lands, but they are generally fatal. Escaping into the nearby ancient ruins, the soul-wind reaches you just as you find shelter. Instead of killing you, it imparts on you the ability to see into others’ souls. In the world of Pillars of Eternity, souls are quantifiable and measurable, and the process of reincarnation is fact. Very rarely does a soul remember its past life after it is born anew, however, the soul-wind “woke” your soul. You are now what is called a Watcher. Not knowing what to do with your new-found power, you proceed to Gilded Vale. Upon reaching the town you discover it is afflicted by a curse. For some time now, almost all children are “hollowborn”, meaning they have no soul. You take it upon yourself to find the cause of this affliction, and thus you and your fellowship begin your adventure. Pillars of Eternity takes pride in its ancestry, but it also earns its praise. This game won’t fall victim to being remembered as “oh, that one modern RPG reminiscent of the old Infinity Engine games,” but rather as one of the best, if not the best, RPGs of the year. Definite Game of the Year material here. Pillars of Eternity was developed by Obsidian Entertainment and published by Paradox Interactive. It is currently available for PC and Mac. A digital copy of the game for PC was provided to Save/Continue by the publisher for review purposes.